Suitable for any sporting event, these Custom Sports Cushions are totally bespoke and cut to shape - if you want them shaped as a beer mug then we can! With your Company branding and logo on either one side or both sides for maximum exposure - you can be sure that the customers will take these Custom Sports Cushions home and keep as a momento to remember the sporting event, and re-use for other festivals and concerts! 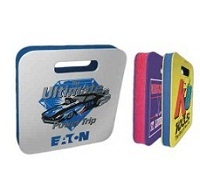 Hand out some of these Custom Sports Cushions to gain some recognition of your Company brand name and logo. For a FREE QUOTE, please fill in the form regarding our Custom Sports Cushions and we'll be able to help you. Why not try our other promotional sports cushions?